While Doug Pederson was busy avoiding one potential pitfall at his Monday press conference, he may have let his guard down and accidentally fallen right into another one. The Philadelphia Eagles rookie head coach was answering a question about the fact that his team was penalized 14 times – compared to just two on the Lions – in Sunday's 24-23 loss in Detroit. Right off the top, Pederson said that he wasn't going to talk about whether or not he agreed with all the calls. Then, he said all the things you would expect a coach to say following a game like that: questionable calls aside, his players are at fault for the vast majority of them and they need to work on correcting them moving forward. But then, he segued into talking about the toughness his team showed to battle back from an early 21-7 deficit despite some calls not going there way ... and it sure sounded like he was taking a shot at his predecessor, Chip Kelly. 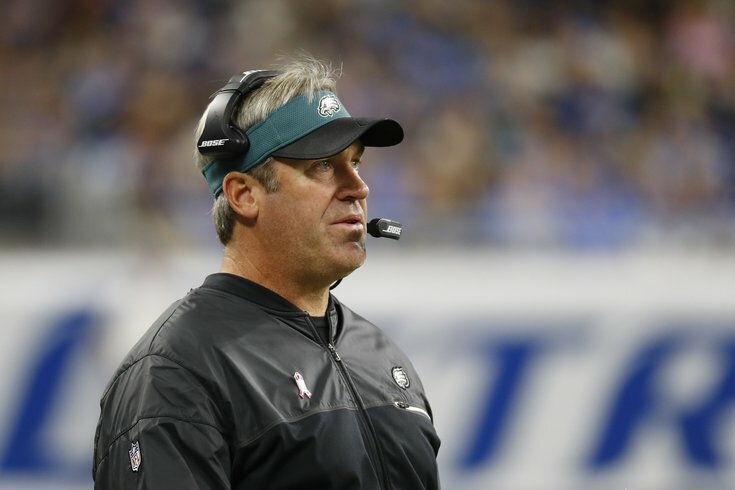 "I think that how we came back in this game, you know, I think it shows the character of this football team and where we are from even a year ago," Pederson said. "I think this game a year ago got out of hand and it got shut down, they got blown out. This group didn't do that yesterday. This group was resilient; this group battled. The sideline was calm. They were — whatever adversity came our way, they were able to overcome it. ... So it’s the sign of a good football team." Pederson isn't wrong. This game did get out of hand when the two teams met on Thanksgiving Day a year ago. It may be hard to remember, but before it was a 45-14 embarrassment on national TV, it was (albeit briefly) a close game. So where does that resiliency come from? Yes, there's a new quarterback and a new defensive system, but according to the Eagles coach, it starts at the top. “I think it comes from the coaches, number one," Pederson said. "There’s no panic on the sideline there with communication. The thing is, the better communication you have with your players on the sideline, it just kind of eases everything. If we’re not prepared as a staff, the players are going to know it, the players are going to see it, and there’s chaos. And, apparently, it's already begun to have an impact on the players. Following the loss in Detroit, Pederson saw a locker room full of players that were not only angry at themselves for whatever individual mistakes they made (see: Mathews, Ryan), but eager to get back out there and fix them. As Pederson put it, "I saw how ticked off this team was at the end of this football game." After a 4-0 preseason and a 3-0 start to the regular season, that could be the kind of attitude that keeps this thing from spiraling out of control. "Despite everything that went on in this game — negative, positive, the whole thing — this is a different football team than a year ago," he said. "This is a resilient football team. This is a team that, when I walked on the plane last night and we were halfway home, everyone is on their iPads watching the game, watching their part. They’re correcting their mistakes. They’re wanting to get back out on the football field. And that’s great. From a coach’s perspective, that’s great to see. It’s great to see your players take ownership that way. The leaders of your team really step up and — yeah, as bad as it hurts, they understand that we let one slide. "My message to them is that every week is going to be a challenge and every week has its own circumstances. But it was great to see the veteran guys — really all the guys back there, from Carson to Malcolm to Fletcher to Connor, Brent Celek — everybody’s back there looking at the game. So this thing, it won’t spiral. They’re taking ownership of it." Since Pederson was not here last season, you have to imagine that he's making these year-to-year comparisons based off what he is hearing from players, assistants that carried over from Kelly's regime, and quite possibly others higher in the organization like Howie Roseman and Jeff Lurie. But no matter his source, the information is accurate. This is a different football team from a year ago. Whether or not that ultimately leads to more wins, well, the jury's still out on that one.